After trying Rice Paper Scissors, I wanted to try their sister company – Rice Paper Sister. I can see they do two different styles and I prefer being seated on dining tables at Sister rather than bar tables and stools at Scissors. Service was fabulous – we enjoyed most of what was recommended from the waiter. When we booked for a table of 4, we were told we could only have the table for 2 hours especially on a Friday night. We stayed well beyond this time – thankfully we didn’t get kicked out as it wasn’t packed. A plus to the service because we stayed for 3 hours. whoops! I ordered the Chiang Mai Virgin Mary – seedlip garden and spice blend, chargrilled capsicum, house spice mix and lemon, $10. Damn this is spicy – I could take capsicum spice but pwoah – I took my time in drinking this mocktail – it was packed full of flavour! I’d probably try their other cocktail/mocktails. Before our orders arrives, we were given some steamed bao with yuzu mayo on the house as starters. Under the appetisers, we ordered 3 of the raw tuna, black caviar on fried bread for $6 each. Definitely cannot share these – but J and I pretty much had half a bite each. I enjoyed the fresh tuna with mild flavours of black caviar. The fried bread was so crispy and airy. It felt like I was eating a crispy shell. J ordered tapioca soft shell crab, togarashi with kewpie for $8. This was worth it. It came in small pieces and the batter was light and you can still feel like you’re eating soft shell crab. They separate a few of the leg pieces so it feels like you’re eating chips. It didn’t feel oily – I dish I would reorder. The next set of dishes were again using our hands. We ordered Hervey bay scallop with fermented coconut vinegar, $6 this was very fresh, we enjoyed the sauce paired with it. Black sesame wafer, calamari, lipino sausage and crab roe for $8 was my pick – and I prefer the scallop more. Although abundant variety of ingredients and I liked the sausage, but I just didn’t feel like there was enough calamari as I had expected. It was very easy to eat with the wafer – easy to share in half. DW & DL ordered the lobster roll, mustard pickle and burnt nori, $9 and Moreton bay bugs, coconut thermidor with shellfish oil, $9. DW enjoyed the Moreton bay bug whereas DL enjoyed the lobster roll more – it was a brioche bun where DW felt a bit “too fried”. For mains we shared goat shoulder, lipino dry curry, with spring onion pancake, $28. The goat shoulder was a little too gamey for us ladies – we would prefer lamb if there was an option – but that’s just our preference. I felt that the spring onion pancake was half a roti and half a spring onion pancake. It lacked spring onions compared with the others I’ve tasted. The dish was good and probably the 2nd favourite main. I was a bit disappointed with the coconut jasmine rice $5 on the side. I thought it was coconut rice, now reading the menu again it’s JASMINE rice… For $5… I’d rather order their flat bread, $6 because I don’t usually make flat bread at home. Their coconut rice was simply jasmine rice with coconut toasted shavings sprinkled on top. No other coconut flavours. The pork neck with spiced honey, $29 was a little heavy on the salt that night. Although it had spiced honey – it didn’t balance in flavour. The texture of the pork neck was good and I enjoyed the large chunky pieces of meat. Another side we ordered was stir-fry chinese cabbage with yellow bean sauce, $8. I cook stir fry garlic with chinese cabbage all the time. It was recommended by the waiter as his favourite – I had my doubts – what’s so special? I was wrong. Damn, this yellow bean sauce is magical. We all loved it! I really want to know how to make this sauce! Save the best til last… the beef short ribs, sticky sauce in lettuce wraps, $30 was our last main. The meat was deboned and absorbed all the flavours from the sauce. The star was the sauce. Fresh lettuce and I really enjoyed wrapping it with the beef ribs and other veggies in the dish with the sauce drizzling down. I’m glad they added veggies because it wouldn’t be as fresh without them. 5/5 on the beef ribs. Lastly, a must-have dish based on my friend, M’s recommendation. 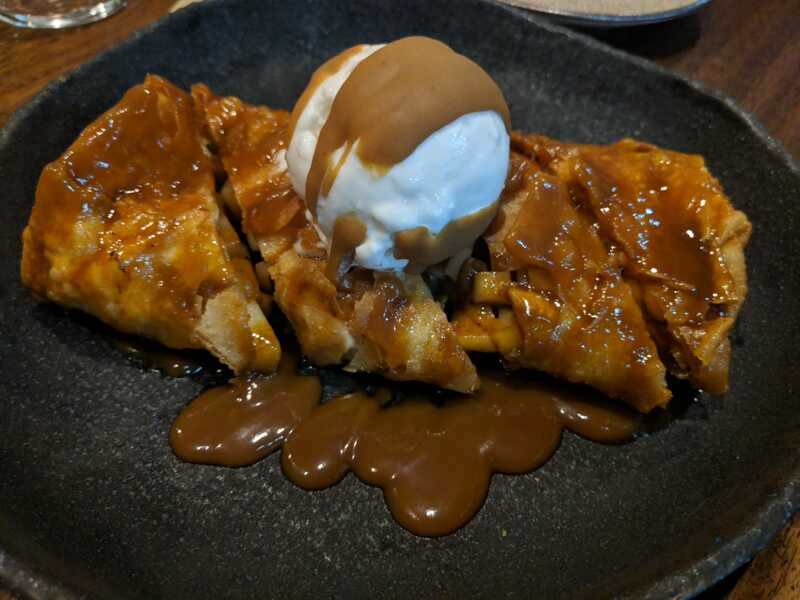 For dessert we ordered hot apple pie with butterscotch sauce and coconut ice-cream, $15. I found the dish reasonably priced and everything was good. DL complimented on the butterscotch sauce and I continued to love the fresh coconut bits from the coconut ice cream. The pie was like roti and it was very nice to have with the warm spiced apple inside. In summary, we had a great time with fabulous service. I felt it was a bit pricey for some of the appetisers ordered. The bill totalled to be just over $50 each. I’d revisit to try other dishes like the lobster roll, lotus chips and reorder the soft shell crab, raw tuna, beef ribs & coconut ice cream on apple pie dessert. Great for groups more than 4.